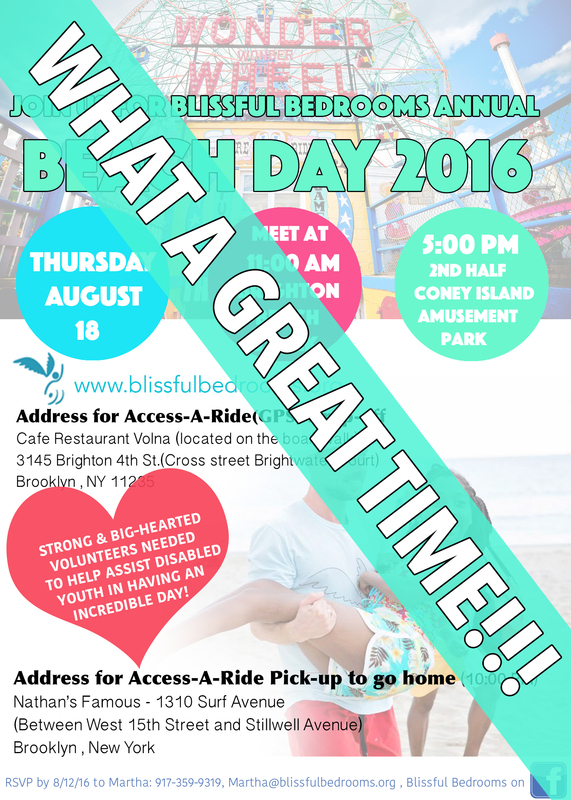 This year’s Beach Day event was our best one EVER!! It was truly an incredibly wonderful day! As the guests and volunteers drove to the beach in the morning, dark, cloudy skies threatened above. But Blissful Bedrooms folks don’t scare easily, and we have resounding faith and the optimistic adaptability skills to turn lemons into lemonade, if somehow things don’t go as planned. So, not one committed guest or volunteer changed their plans because of the ominous weather. Shortly after we arrived, the clouds miraculously disappeared and it was nothing but sunny skies the rest of the day! We were 80+ people strong – one big, happy family spending a long, glorious day together delighting in simple summer joys! The entire day went off so smoothly and that was because we had the most awesome and hardworking volunteer team! Only the very brave, strong and loving dare to sign up to volunteer for this event and our team was solid as a rock. These kind-hearted people dedicated their time, their caring hearts and their stamina and brawn (some put in a whopping total of 21 volunteer hours of non-stop effort by the time the last guest was delivered home safely!). We truly felt the love of the Brighton Beach and Coney Island community everywhere we went. From neighborhood people on the beach, who were so welcoming and enchanted by our group, to the generous sponsorships and help we received, Blissful Bedrooms was truly blessed. The Parks Department supplied us with beach wheelchairs and the staff who delivered them were so kind and friendly. Nathan’s Famous fully sponsored our traditional dinner of hot dogs and fries on the boardwalk. Denos Wonder Wheel Amusement Park, our longstanding and loyal sponsors, started our evening off with our traditional rides on the Wonder Wheel, bumper cars and Spook-a-rama haunted house. Luna Park put the sweet cherry on top by sponsoring wrist bands for all of our guests, allowing us to experience thrilling ride after ride, all night long. Our Beach Day 2016 is now a beautiful memory that the volunteers and guests alike will never forget, The Joyometer reached a record high this year! Enormous gratitude to everyone who helped make it happen! If you were inspired by the beauty and joy of this event, please consider helping us fund our final event of the summer – the 4th Annual Camping Trip to the Blissful Cabin in the Catskills. This is the biggest and most costly undertaking of our entire year of serving disabled youth and we can surely use your help. Please make a donation of any amount here and/or volunteer. Thank you!